The TED conference, started in 1984, has become the standard bearer for hosting insightful talks on a variety of important subjects. They have made videos of over 1,900 of these talks freely available online and they have been watched more than a billion times! In 2009 they extended the concept to “TEDx Talks” in the same format but hosted by independent organizations all over the world. TEDX – What’s Happening With Artificial Intelligence ? But you can see videos of some of my older lectures where audience members stand up, red in the face, screaming things like “economics doesn’t describe intelligence”. Others have argued that it is due to an insufficiently “feminine” view of intelligence. Others say that this is “anthropomorphizing” or “only applies to evolved systems” or “only applies to systems built on logic” or “only applies to emotional systems”. Hundreds of vitriolic posts on discussion forums have argued with this simple insight. And there have even been arguments that autonomy is just a “myth”. In a widely-read paper, I called these the “Basic AI Drives”. But they apply to any system which is trying to accomplish something including biological minds, committees, companies, insect hives, bacteria, etc. It’s especially easy to see why evolution rewards reproduction but these drives are not restricted to systems that have evolved. I used the goal of “play good chess” because it’s simple to understand and seems harmless. But the same logic applies to almost any simple goal. In the papers, I describe some “perverse” goals (like the goal of “turning yourself off”) where they don’t apply but these aren’t relevant for most real systems. Does this mean that we shouldn’t build autonomous systems? Of course not! It just means that creating intelligence is only part of the problem. We also need to create goals which are aligned with human values. Is that impossibly difficult? I’ve seen no evidence that it’s extremely hard, but simple proposals tend to create complex incentives which lead to the same kinds of behavior in a more complicated form. What we really need is a rigorous science of the behavior of goal-driven systems and an engineering discipline for the design of safe goals. In a recent paper, Tsvi Benson-Tilsen and Nate Soares analyzed a formal model of these phenomena which I think is a great start! We are delighted to have Steve Omohundro, Ph.D. present at our Meetup this month. This is a Meetup of the Artificial Intelligence and Robotics Interest Group of the Santa Clara County Bar Association High Technology Law Section, and the Artificial Intelligence Committee of the American Bar Association Section of Science & Technology Law. Steve Omohundro has been a scientist, professor, author, software architect, and entrepreneur doing research that explores the interface between mind and matter. He has degrees in Physics and Mathematics from Stanford and a Ph.D. in Physics from U.C. Berkeley. He was a computer science professor at the University of Illinois and cofounded the Center for Complex Systems Research. He published the book “Geometric Perturbation Theory in Physics”, designed the programming languages StarLisp and Sather, wrote the 3D graphics system for Mathematica, and built systems which learn to read lips, control robots, and induce grammars. He is president of both Possibility Research and Self-Aware Systems, a think tank working to ensure that intelligent technologies have a positive impact. His work on positive intelligent technologies was featured in James Barrat’s book “Our Final Invention” and has generated international interest. He serves on the advisory boards of the Cryptocurrency Research Group, the Institute for Blockchain Studies, Design Economics, Dfinity, Cognitalk, and is the chair of the Silicon Valley ACM Artificial Intelligence SIG. Robot manufacturing, self-driving cars, 3-d printed houses, agricultural drones, etc. are poised to dramatically improve human life and eliminate drudgery. McKinsey predicts that AI and Robotics will create $50 trillion in value over the next 10 years. But these systems also create many new regulatory challenges. We will need new technological and legal governance strategies to receive the benefits without causing harm. When a self-driving car kills someone, who is liable? If I create a harmful robot, I am liable, but if I create an AI system which creates a harmful robot, am I still liable? Already humans are avoiding liability by using automated systems for price fixing, insider trading, discrimination, downloading illegal content, and making illegal drug purchases. Many robotic systems can easily be made anonymous but anonymous drones, self-driving cars, and online bots can be used for extortion, assassination, blackmail, theft, terror, etc. And intelligent systems can behave in unpredictable ways. Recent “deep learning” neural networks create models with huge blindspots. The behavior of advanced autonomous systems will be even less predictable by their creators. Rational systems with simplistic goals exhibit “rational drives” toward self-preservation, resource acquisition, replication, and self-improvement. What is the liability for creating harmful systems? We need to develop new technologies to reliably control these systems and a new regulatory regime to incentivize safe and beneficial behavior. We describe Ethereum’s “Smart Contracts” as a possible technological component. But many additional new ideas are clearly needed. A dial-in number will be provided no later than the morning of the talk. Slides: Right before the talk, a link to see any slides the speaker wants to present will be provided. (There may or may not be slides.) This link will expire at the end of the talk, but we will distribute a pdf of the slides by download afterwards. Please RSVP and let us know by a comment if you are planning to attend in person. Many people seem to be misunderstanding the nature of mathematical proof in discussions of AI and software correctness, security, and safety. In this post, I’ll describe some of the background and context for this. Almost every aspect of logic and mathematical proof has its origins in human language which emerged about 100,000 years ago. 2500 years ago, Aristotle and Euclid began the process of making the natural language rules precise. Modern logic began in 1677 when Leibniz tried to create a “calculus ratiocinator” to mechanically check precise arguments. The job was finished by Frege, Cantor, Zermelo, and Fraenkel in 1922 when they created a precise logical system capable of representing every mathematical argument and which stands as the foundation for mathematics today. Church and Turing extended this system to computation in 1936. Every precise argument in every computational, engineering, economic, scientific, and social discipline can be precisely represented in this formalism and efficiently checked on computer. Some had hoped that beyond checking arguments, every statement might also be proven true or false in a mechanical way. These hopes were dashed by Goedel in 1931 when he published his incompleteness theorem showing that any logical system rich enough to represent the natural numbers must have statements which can neither be proven true nor false. In 1936 Turing found a simple computational variant now called “the halting problem” which showed there are some properties of some programs which cannot be proven or disproven. But the Goedel statements and the uncomputable program properties are abstruse constructions that we never want to use in engineering! Engineering is about building devices we are confident will behave as we intend! Any decent programmer will have an argument as to why his program will work as intended. If he doesn’t have such an argument, he should be fired! If his argument is correct, it can be precisely represented in mathematical logic and checked by computer. The fact that this is not current standard practice is not due to limitations of logic or understanding but to sloppiness in the discipline and poor educational training. If engineers built bridges the way that we write programs, no one would dare drive over them. The abysmal state of today’s level of software correctness and security will likely be looked at with wonder and disgust by future generations. Future intelligent systems could cause great harm to humanity. Because of the large risks, if we are to responsibly build intelligent systems, they must not only be safe but we must be very convinced that they are safe. For example, an AI which is taught human morality by reinforcement learning might be safe, but it’s hard to see how we could become sufficiently convinced to responsibly deploy it. Before deploying an advanced intelligent system, we should have a very convincing argument for its safety. If that argument is rigorously correct, then it is a mathematical proof. This is not a trivial endeavor! It’s just the only path that appears to be open to us. The mathematical foundations of computing have been known since Church and Turing‘s work in 1936. 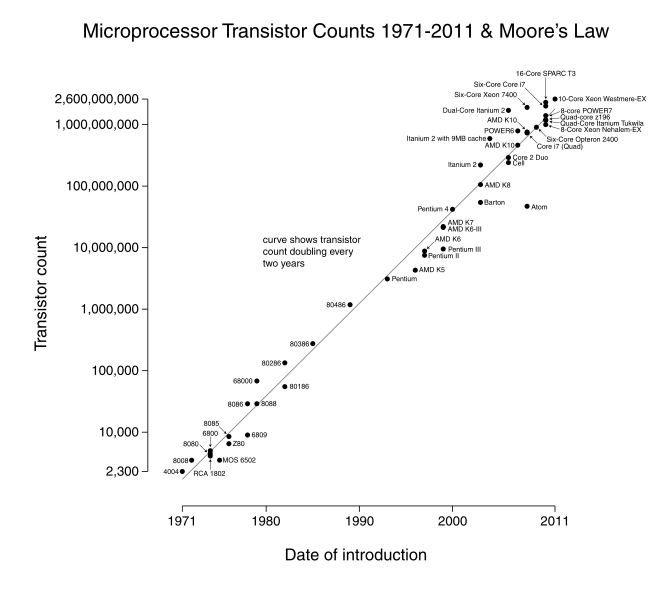 Both created computational models which were simultaneously logical models about which theorems could be proved. Church created the lambda calculus which has since become the foundation for programming languages and Turing created the Turing machine which is the fundamental model for the analysis of algorithms. Many systems for formal verification of properties of hardware and software have been constructed. John McCarthy created the programming language Lisp very explicitly from the lambda calculus. I studied with him in 1977 and did many projects proving properties of programs. de Bruijn‘s Automath system from 1967 was used to prove and verify many mathematical and computational properties. There are now more than one hundred formal methods systems and they have been used to verify a wide variety of hardware systems, cryptographic protocols, compilers, and operating systems. After Intel had to write off $475 million due to the Pentium P5 floating point division bug, they started verifying their hardware using formal methods. While these advances have been impressive, the world’s current technological infrastructure is woefully buggy, insecure, and sloppy. Computer science should be the most mathematical of all engineering disciplines with a precise stack of verified hardware, software, operating systems, and networks. Instead we have seething messes at all levels. Building precise foundations will not be easy! I have been hard at work on new programming languages, specification languages, verification principles, and principles for creating specifications. Other groups have been proceeding in similar directions. Fortunately, intelligent systems are likely to be very helpful in this enterprise if we can build a trust foundation on top of which we can safely use them. I have proposed the “Safe-AI Scaffolding Strategy” as a sequence of incremental steps toward the development of more powerful and flexible intelligent systems in which we have provable confidence of safety at each step. The systems in the early steps are highly constrained and so the safety properties are simpler to specify: only run on specified hardware, do not use more than the allocated resources, do not self-improve in uncontrolled ways, do not autonomously replicate, etc. Specifying the safety properties of more advanced systems which directly engage with the world is more challenging. I will present approaches for dealing with those issues at a later time. On March 26, 2015 Steve Omohundro gave a talk in the IBM Research 2015 Distinguished Speaker Series at the Accelerated Discovery Lab, IBM Research, Almaden. Here are the slides as a pdf file. One of the goals was to present both the exciting possibilities of these technologies and the potential dangers while describing concrete steps we can take today to ensure a positive outcome. Participants have said they came away with that perspective. The show beautifully explores a number of important ethical issues regarding privacy, security, and AI. The third season and the coming fourth season focus on the consequences of intelligent systems developing agency and coming into conflict with one another. “Other AI experts take a more nuanced view. Building more autonomy into weaponized robotics can be dangerous, according to computer scientist and entrepreneur Steven Omohundro. But the dangers can be mitigated through proper design. On September 18, 2014 Steve Omohundro gave the Xerox PARC Forum on “AI and Robotics at an Inflection Point”. Here’s a PDF file of the slides. Google, IBM, Microsoft, Apple, Facebook, Baidu, Foxconn, and others have recently made multi-billion dollar investments in artificial intelligence and robotics. Some of these investments are aimed at increasing productivity and enhancing coordination and cooperation. Others are aimed at creating strategic gains in competitive interactions. This is creating “arms races” in high-frequency trading, cyber warfare, drone warfare, stealth technology, surveillance systems, and missile warfare. Recently, Stephen Hawking, Elon Musk, and others have issued strong cautionary statements about the safety of intelligent technologies. We describe the potentially antisocial “rational drives” of self-preservation, resource acquisition, replication, and self-improvement that uncontrolled autonomous systems naturally exhibit. We describe the “Safe-AI Scaffolding Strategy” for developing these systems with a high confidence of safety based on the insight that even superintelligences are constrained by mathematical proof and cryptographic complexity. It appears that we are at an inflection point in the development of intelligent technologies and that the choices we make today will have a dramatic impact on the future of humanity. Steve Omohundro has been a scientist, professor, author, software architect, and entrepreneur doing research that explores the interface between mind and matter. He has degrees in Physics and Mathematics from Stanford and a Ph.D. in Physics from U.C. Berkeley. He was a computer science professor at the University of Illinois at Champaign-Urbana and cofounded the Center for Complex Systems Research. He published the book “Geometric Perturbation Theory in Physics”, designed the programming languages StarLisp and Sather, wrote the 3D graphics system for Mathematica, and built systems which learn to read lips, control robots, and induce grammars. He is president of Possibility Research devoted to creating innovative technologies and Self-Aware Systems, a think tank working to ensure that intelligent technologies have a positive impact. His work on positive intelligent technologies was featured in James Barrat’s book “Our Final Invention” and has been generating international interest. 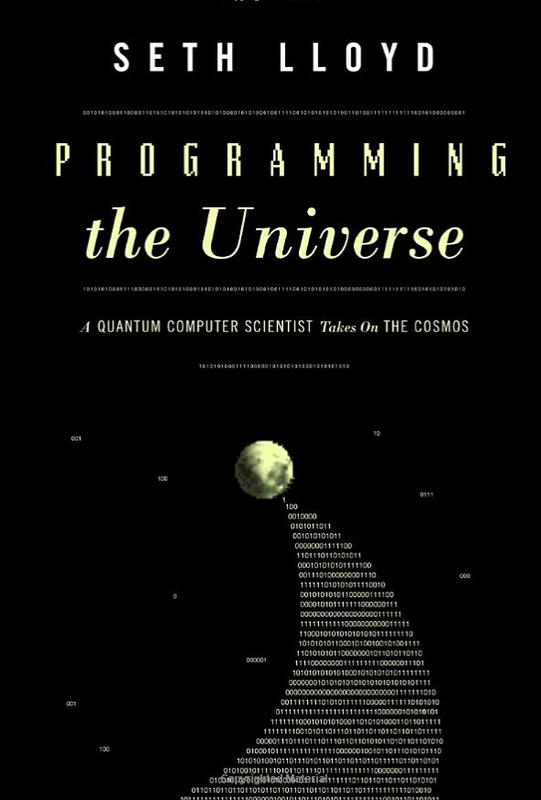 Seth Lloyd analyzed the computational capacity of physical systems in his 2000 Nature paper “Ultimate physical limits to computation” and in his 2006 book “Programming the Universe”. Using the very general Margolus-Levitin theorem, he showed that a 1 kilogram, 1 liter “ultimate laptop” can perform at most 10^51 operations per second and store 10^31 bits. 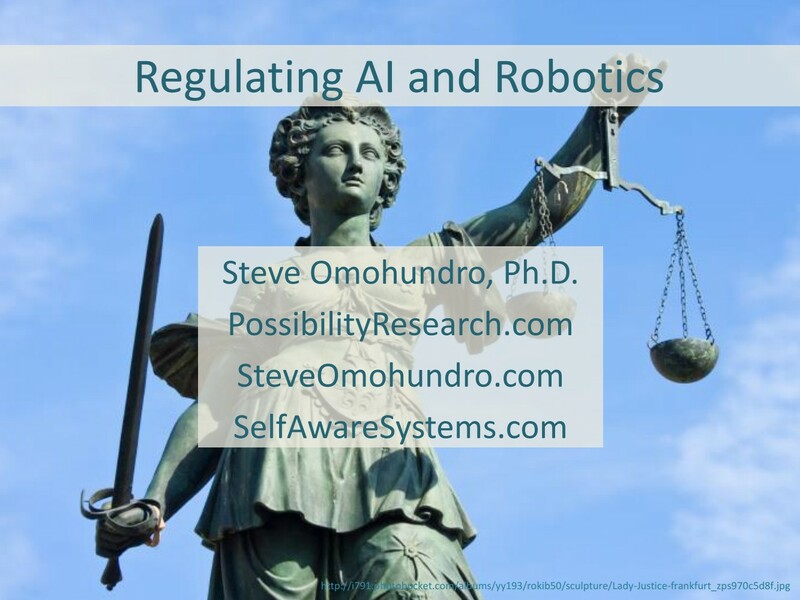 On September 6, 2014, Steve Omohundro spoke to the Society International about the impact of AI and Robotics. Here are the slides as a PDF file. Google, IBM, Microsoft, Apple, Facebook, Baidu, Foxconn, and others have recently made multi-billion dollar investments in artificial intelligence and robotics. 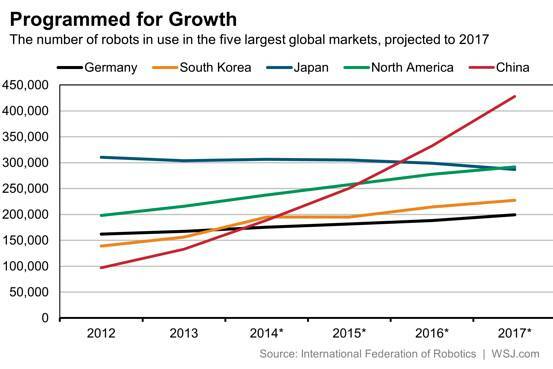 More than $450 billion is expected to be invested into robotics by 2025. All of this investment makes sense because AI and Robotics are likely to create $50 to $100 trillion dollars of value between now and 2025! This is of the same order as the current GDP of the entire world. Much of this value will be in ideas. Currently, intangible assets represent 79% of the market value of US companies and intellectual property represents 44%. 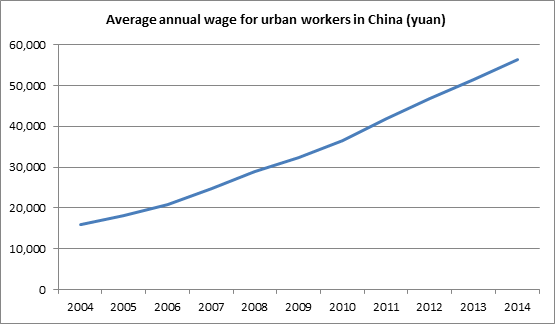 But automation of physical labor will also be significant. Foxconn, the world’s largest contract manufacturer, aims to replace 1 million of its 1.3 million employees by robots in the next few years. An Oxford study concluded that 47% of jobs will be automated in “a decade or two”. Automation is also creating arms races in high-frequency trading, cyber warfare, drone warfare, stealth technology, surveillance systems, and missile warfare. Recently, Stephen Hawking, Elon Musk, and others have issued strong cautionary statements about the safety of intelligent technologies. We describe the potentially antisocial “rational drives” of self-preservation, resource acquisition, replication, and self-improvement that uncontrolled autonomous systems naturally exhibit. 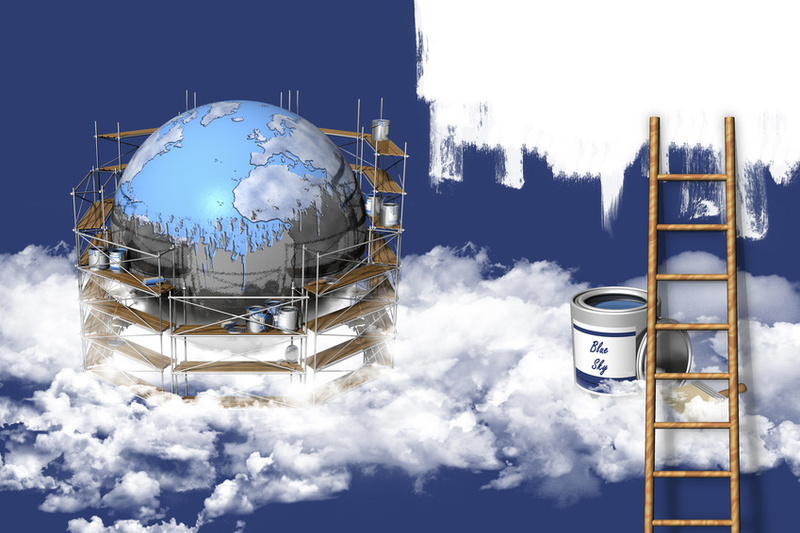 We describe the “Safe-AI Scaffolding Strategy” for developing these systems with a high confidence of safety based on the insight that even superintelligences are constrained by mathematical proof and cryptographic complexity. It appears that we are at an inflection point in the development of intelligent technologies and that the choices we make today will have a dramatic impact on the future of humanity. Stephen Hawking’s and other’s recent cautions about the safety of artificial intelligence have generated enormous interest in this issue. My JETAI paper on “Autonomous Technology and the Greater Human Good” has now been downloaded more than 10,000 times, the most ever for a JETAI paper. This has led to the paper becoming the most downloaded JETAI paper ever! On March 25, 2014, Steve Omohundro gave the invited talk “Positive Artificial Intelligence” at the AAAI Spring Symposium Series 2014 symposium on “Implementing Selves with Safe Motivational Systems and Self-Improvement” at Stanford University. 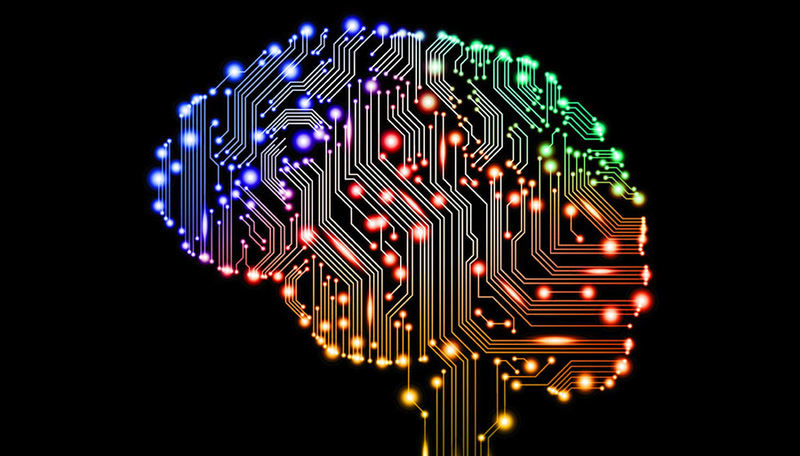 AI appears poised for a major social impact. In 2012, Foxconn announced they will be buying 1 million robots for assembling iPhones and other electronics. In 2013 Facebook opened an AI lab and announced the DeepFace facial recognition system, Yahoo purchased LookFlow, Ebay opened an AI lab, Paul Allen started the Allen Institute for AI, and Google purchased 8 robotics companies. In 2014, IBM announced they would invest $1 billion in Watson, Google purchased DeepMind for a reported $500 million, and Vicarious received $40 million of investment. Neuroscience research and detailed brain simulations are also receiving large investments. Popular movies and TV shows like “Her”, “Person of Interest”, and Johnny Depp’s “Transcendence” are exploring complex aspects of the social impact of AI. Competitive and time-sensitive domains require autonomous systems that can make decisions faster than humans can. Arms races are forming in drone/anti-drone warfare, missile/anti-missile weapons, bitcoin automated business, cyber warfare, and high-frequency trading on financial markets. 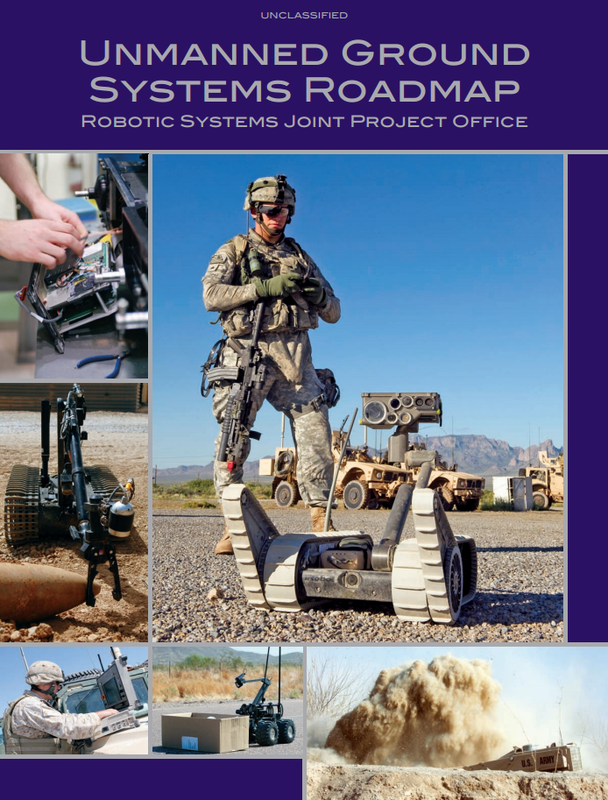 Both the US Air Force and Defense Department have released roadmaps that ramp up deployment of autonomous robotic vehicles and weapons. AI has the potential to provide tremendous social good. Improving healthcare through better diagnosis and robotic surgery, better education through student-customized instruction, economic stability through detailed economic models, greater peace and safety through better enforcement systems. But these systems could also be very harmful if they aren’t designed very carefully. We show that a chess robot with a simplistic goal would behave in anti-social ways. We describe the rational economic framework introduced by von Neumann and show why self-improving AI systems will aim to approximate it. We show that approximately rational systems go through stages of mental richness similar to biological systems as they are allocated more computational resources. We describe the universal drives of rational systems toward self-protection, goal preservation, reproduction, resource acquisition, efficiency, and self-improvement. Today’s software has flaws that have resulted in numerous deaths and enormous financial losses. The internet infrastructure is very insecure and is being increasingly exploited. It is easy to construct extremely harmful intelligent agents with goals that are sloppy, simplistic, greedy, destructive, murderous, or sadistic. If there is any chance that such systems might be created, it is essential that humanity create protective systems to stop them. As with forest fires, it is preferable to stop them before they have many resources. An analysis of the physical game theory of conflict shows that a multiple of an agent’s resources will be needed to reliably stop it. There are two ways to control the powerful systems that today’s AIs are likely to become. The “internal” approach is to design them with goals that are aligned with human values. We call this “Utility Design”. The “external” approach is to design laws and economic incentives with adequate enforcement to incentivize systems to act in ways that are aligned with human values. We call the technology of enforcing adherence to law “Accountability Engineering”. We call the design of economic contracts which includes an agent’s effects on others “Externality Economics”. The most powerful tool that humanity currently has for accomplishing these goals is mathematical proof. But we are currently only able to prove the properties of a very limited class of system. We propose the “Safe-AI Scaffolding Strategy” which uses limited systems which are provably safe to design more powerful trusted system in a sequence of safe steps. A key step in this is “Accountable AI” in which advanced systems must provably justify actions they wish to take. If we succeed in creating a safe AI design methodology, them we have the potential to create technology to dramatically improve human lives. Maslow’s hierarchy is a nice framework for thinking about the possibilities. At the base of the pyramid are human survival needs like air, food, water, shelter, safety, law, and security. Robots have the potential to dramatically increase manufacturing productivity, increase energy production through much lower cost solar power, and to clean up pollution and protect and rebuild endangered ecosystems. Higher on the pyramid are social needs like family, compassion, love, respect, and reputation. A new generation of smart social media has the potential to dramatically improve the quality of human interaction. Finally, at the top of the pyramid are transcendent needs for self-actualization, beauty, creativity, spirituality, growth, and meaning. It is here that humanity has the potential to use these systems to transform the very nature of experience. We end with a brief description of Possibility Research’s approach to implementing these ideas. “Omex” is our core programming language designed specifically for formal analysis and automatic generation. “Omcor” is our core specification language for representing important properties. “Omai” is our core semantics language for building up models of the world. “Omval” is for representing values and goals and “Omgov” for describing and implementing effective governance at all levels. The quest to extend cooperative human values and institutions to autonomous technologies for the greater human good is truly the challenge for humanity in this century. The TED Conference (Technology, Entertainment, and Design) has become an important forum for the presentation of new ideas. It started as an expensive ($6000) yearly conference with short talks by notable speakers like Bill Clinton, Bill Gates, Bono, and Sir Richard Branson. In 2006 they started putting the talks online and gained a huge internet viewership. TEDx was launched in 2009 to extend the TED format to external events held all over the world. In May 2012 I had the privilege of speaking at TEDx Tallinn in Estonia. The event had a diverse set of speakers including a judge from the European Court of Human Rights, artists, and scientists and was organized by Annika Tallinn. Her husband, Jaan Tallinn, was one of the founders of Skype and is very involved with ensuring that new technologies have a positive social impact. They asked me to speak about “Smart Technology for the Greater Good”. It was an excellent opportunity to summarize some of what I’ve been working on recently using the TEDx format: 18 minutes, clear, and accessible. I summarized why I believe the next generation of technology will be more autonomous, why it will be dangerous unless it includes human values, and a roadmap for developing it safely and for the greater human good.